The CWA bargaining committee has reached a tentative agreement with American Airlines subsidiary Piedmont Airlines. The proposed contract covers more than 6,000 passenger service agents at Piedmont. Members have been mobilizing at their airports and at community events, putting pressure on the company to reach a fair agreement. After the company reneged on its commitment to include retroactive pay in a new contract, thousands of agents contacted Eric Morgan, Piedmont's Vice President of Ground Handling, demanding that retroactive pay and fair wage scales be included in the new agreement. In addition to having a formula for retroactive pay and wage increases, the agreement makes improvements to mandatory overtime notification, vacation time, and benefits. Details of the agreement will be provided to the members and a ratification vote will be scheduled in the coming weeks. 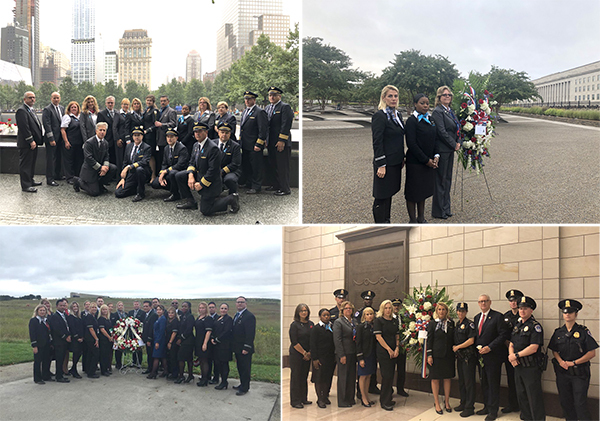 On Wednesday, passenger service agents from American Airlines subsidiary Envoy Air rallied at Dallas-Ft. Worth Airport to step up their calls for sustainable, family supporting wages. The agents have been trying to negotiate a contract with fair, family-sustaining wages for years, leaving many to rely on public assistance to survive. The workers, joined by other airport employees, union leaders, and community supporters, talked with travelers about their concerns and asked for their support in standing up to American Airlines. "Any corporation that bases its success upon paying its workers less than a living wage has a bad business model," said Terry Meza, candidate for State Representative (Texas, 105th District), who joined the agents at the rally. In bargaining last week, the CWA Envoy Air committee continued to discuss issues with the company including protections for members, the drug policy and testing procedure, and more, but the real fight continues to be on livable wages. CWA's bargaining committee is committed to fight one day longer to bring back a contract that meets Envoy agents' needs. The next bargaining is scheduled for November 5-6. 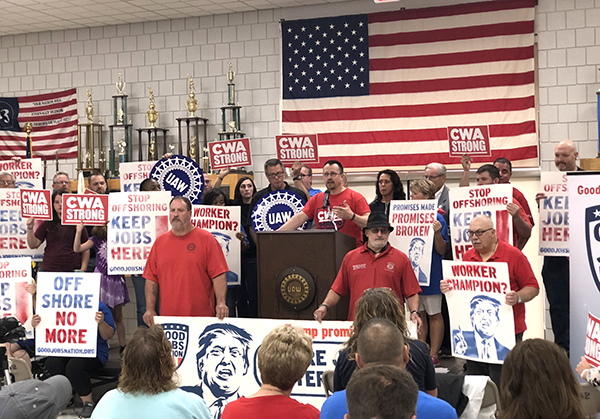 As part of their "Promises Broken" pickup tour, Good Jobs Nation held an event in Warren, Ohio, featuring CWA members at AT&T who are fighting back against the offshoring of U.S. jobs. The pickup tour's goal is to raise public awareness on how, despite his campaign promises, the offshoring of American jobs by U.S. corporations has increased to record levels on President Trump's watch. At the event, Mike Sullivan, a member of CWA Local 4320 who works at an AT&T call center in Youngstown, said that his union job is one of the few good jobs in his community, and explained how AT&T’s offshoring and outsourcing is harming the company's quality of service, mentioning that he often hears from customers frustrated with the company's offshoring practices. "So far this year in 2018, AT&T has made over $10 billion in profit, and they're expecting billions more with the tax breaks they receive, and nearly a billion dollars in federal contracts. But still, they close so many of our call centers and outsource our work," said Sullivan. "The bottom line is, if my taxpayer dollars are going to line their pockets, they need to be held accountable, and they can't be allowed to keep sending our jobs overseas. We need those good jobs here to support our families and communities, and we need them now – not later." As part of their "Promises Broken" pickup tour, Good Jobs Nation held an event in Warren, Ohio, featuring CWA members at AT&T who are fighting back against offshoring of U.S. jobs. Following a 10 week recess, negotiations between NABET-CWA and NBCUniversal resumed last week in New York City. At this point in the process, resolving all open economic issues is crucial to reaching an overall tentative agreement that the membership can properly consider for a ratification vote. The company's stingy stance is untenable, given the financial windfall NBCU received when Congress drastically reduced the corporate tax rate. The company continues to offer miserly wage increases amounting to less than a cost-of-living increase. As the CWA bargaining committee continues to negotiate with Nokia, the company has not backed down on their proposal to eliminate its union workforce, one of the oldest bargaining units in CWA. The unit has more than 100 years of history, originally as Western Electric, then AT&T Technologies, Lucent Technologies, Alcatel-Lucent, and now Nokia. The bargaining committee asked members to continue to spread the word encouraging as many people as possible to send an online letter to Nokia CEO Rajeev Suri and Nokia Bargaining Chair Steve Muscat, urging Nokia not to eliminate American jobs and benefits, to bargain in good faith with the union for a fair deal that allows Nokia to invest in the U.S., to keep its long-standing installation workforce, and to maintain the quality of service and secure telecommunications infrastructure for U.S. customers. A new report by the Institute for Policy Studies sheds light on how our taxpayer dollars are subsidizing outrageous CEO pay at corporations that pay their employees low wages. The report highlights American Airlines. A CWA report from earlier this year found that 27% of the employees at American's wholly-owned subsidiary Envoy Air are paid poverty wages. Watch Senator Bernie Sanders' video on the pay report, featuring CWA member Heather Hudson. 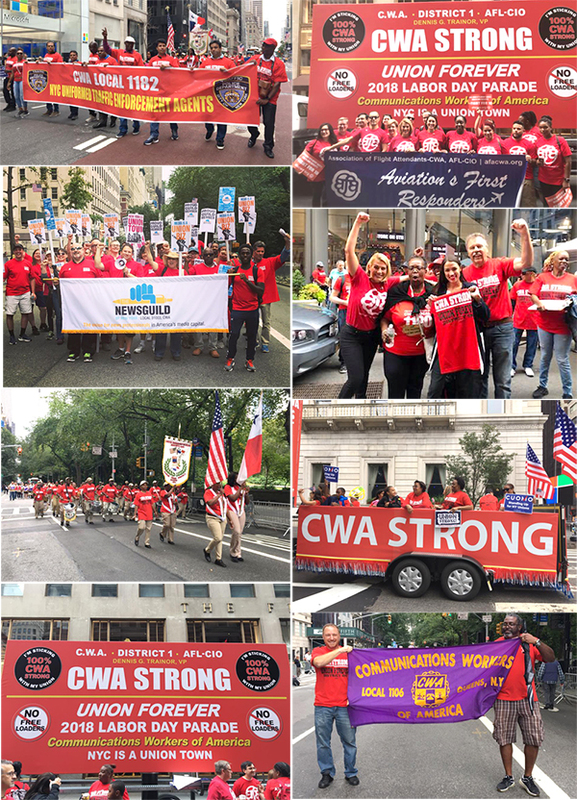 On Saturday, thousands of CWA District 1 members gathered to march in the annual New York City Labor Day Parade. One week after announcing their intentions to seek representation by the NewsGuild-CWA, employees at ReWire.News, a nonprofit news website reporting on reproductive and sexual health, rights, and justice, received voluntary recognition for their union. CWA members can now receive a free, six-issue subscription to In These Times, a progressive, monthly magazine that covers labor and democracy issues and other issues of critical importance to working people. The magazine has provided great coverage of CWA's campaigns, including collective bargaining and organizing fights. In These Times employees are represented by the NewsGuild-CWA. Each issue of In These Times includes investigative reporting, original essays, and debate about our country's democracy, direction, and political future. This offer is made possible through a grant from the Puffin Foundation of Teaneck, N.J., a staunch supporter of workers' rights. Click on this link to sign up for your free six-issue subscription.